When John Mercy-of-Christ's soldiers ran up against weapons like none they had ever seen before, John's campaign to defeat the enemies of The True Word and Flesh came to a sudden halt. Once guns that could only come from Old Earth arrived, the doctrinal differences between his sect and the Chosen of the Holy Ghost had to be put to one side-for what other abominations might be in store? 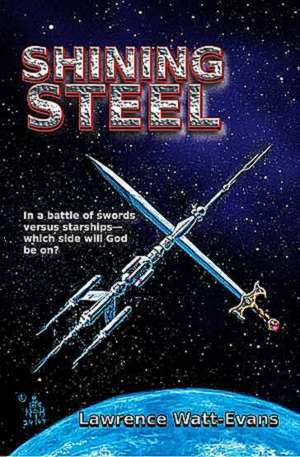 If the starships of Earth were to battle the swords of Godsworld, John was ready for that war. But what he wasn't ready for was just how much the new war was going to change him. Cover art by N. Taylor Blanchard. You can order ebook editions of Shining Steel from the following outlets. The links below will take you directly to the order links for this title. Shining Steel from the Apple iBook Store. You may order the print edition of Shining Steel from FoxAcre Press, or from most major online booksellers. The links below will take you directly to the order links for this title.